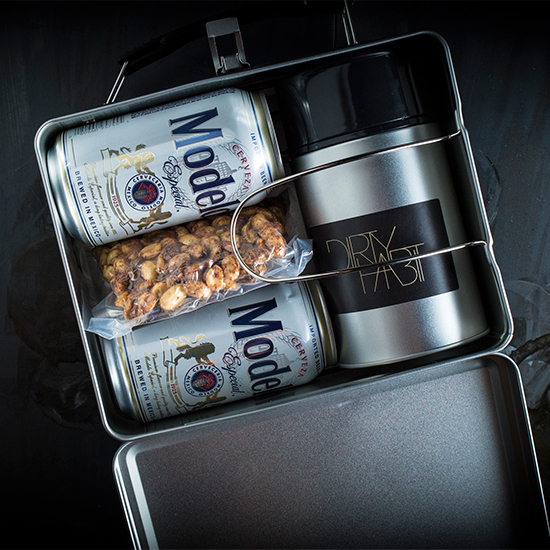 This San Francisco bar is serving lunchboxes packed with something even better than a PB&J with the crusts cut off: alcohol. The folks at San Francisco’s week-old bar Dirty Habit (formerly Fifth Floor) are doing a lot of things right. They’re pouring rare whiskies, they’re offering year-round outdoor seating on a beautiful patio and they’re attracting the city’s techies by providing electrical outlets all over the place. But the greatest thing they’re doing is serving lunchboxes packed with something even better than a PB&J with the crusts cut off: alcohol. Right now, the thermos is filled with a hot toddy made with Buffalo Trace bourbon and ginger syrup in place of honey. The beers are PBRs. And the snack is a bag of mixed nuts tossed with harissa and paprika. The cocktail, beers and snacks will change with the season to include items like 21st Amendment’s Hell or High Watermelon wheat beer and house-made chicharrónes. Just like mom use to pack.